I know this has come up many times on the old forum, but I thought I'd bring it up again as newer packs are constantly being introduced. Theres Kifaru, Mystery Ranch, Dana Design internals and the discontinued externals, Gregory, Osprey, Badlands, and Eberlstock( if I missed one please throw it in there). I have been using a Dana Design External for several years both the Terraframe and the Longbed, I used the Terraframe for my first sheep hunt this year and my partner was using a Badlands. I tried his pack on and decided to make the switch as his was so much more comfortable than my external. I bought a Badlands 4500 which felt very good however I did not like the design of the bag where you stuff everything into one whole and have to dig everyting out when you need something. For example my spotter is buried in the pack , my rain gear is buried in the pack. I really liked the two rear long pockets my Terraframe had , one for spotter and the other for rain gear and snacks and such. I am now looking at a either a Mystery Ranch G6000 or picking up a used Dana Terraplane or Astralplane. Looking for advice from those who have used theirs and the likes and dislikes of them. I am also looking at the weights of the different packs as when your shaving so much weight for sheep hunting you dont want to make up for it with the extra 3lbs of pack weight. So throw your opinion and experience in here. Thanks. I used a Osprey Crescent 110 . awesome pack, packed out a entire sheep and gear at around 130+ lb bag and did great. Taylor at Wiggy's sells them if you want to check them out. I just got done with a 12 day 50+ mile walkin sheep hunt. I used a Kelty 50th anniversary pack. It fits me good but does not fit my partner. Got it on ebay for $185.00. 7200 ci just under 7lbs. External frame but sort of a morph between and internal and external. Trained all summer with 85lbs. Went in with about 75lbs. Hauled a sheep, head/horns out. At times I know I had to have been 140lbs+. I really liked the pack. I used a barneys frame with an old kelty bag on it several years ago and it worked good but the kelty gives much more freedom of movement because of the design. A/C, have a look at this thread over on the Outdoor Gear forum: ( http://forums.outdoorsdirectory.com/...ead.php?t=2276 ) for some input on the Mystery Ranch Packs. I'll let you know how my G-6000 performs when I get back from my goat hunt in a couple weeks. Busta I did read that thread, I was just hoping guys could throw in theiir personal experiences with different packs and what ended up being the Jewel of the Nile if you know what I mean. I used Kelty and Camp trails for years. The first time I loaded up a Dana Design External I thought I had died and gone to heaven, the search for similar comfort in a more streamlined package and an internal design is where I am at now. I packed whole sheep, black bear and caribou in those Dana externals with no problem and in some comfort(if you can ever really be comfortable with over 100# on your back). I am thinking about going with a Terraplane off ebay since I love the design of the bag on my old terraframe. I loved the comfort of the Badlands 4500 but the bag design was not user friendly to me and I strongly dislike pockets that are not part of the bag they move around too much. I know those older dana design Terraplanes are rock solid workhorses so maybe I'll seek one of those out before dropping 5 bills on a Mystery Ranch. They are almost identical in design. That's me with a Dana Longbed loaded to 105lbs. It got weighed as soon as we got home. It worked fine, but I did get sore at times, and frequently transfered the weight between my shoulder and hips by adjusting the various straps. I don't know, maybe there's a pack that makes 100lbs disappear, but I doubt it. Always looking for improvement though, so I always read thread like this one. Thats a great photo Brian and those Dana externals are true workhorses no doubt. Your right though always looking for something better. I was wearing my Terraframe on my sheep hunt last month fully loaded with base camp stuff weighing in at about 70lbs, my partner had a Badlands weighing about the same and after hours of hiking I tried his pack on, it felt so much better than my external Dana so the search began as soon as I got back for an internal that would do everything the Longbed and Terraframe has already done for me. 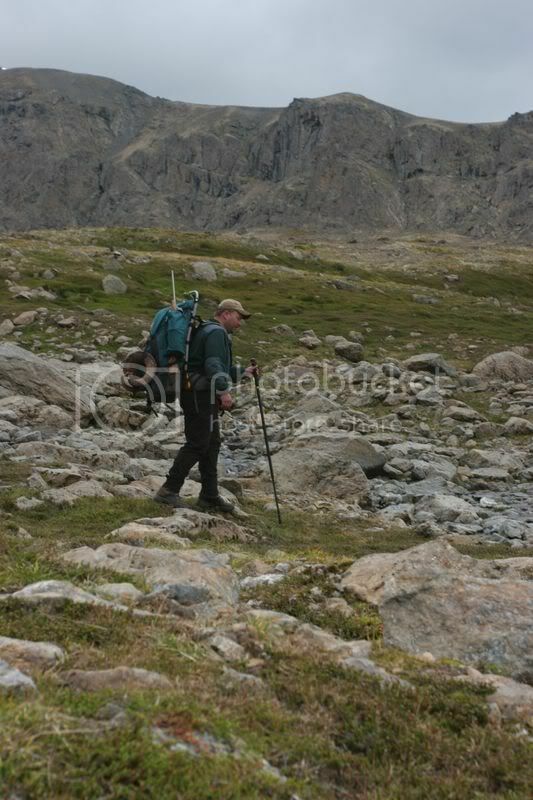 I packed a ram down a mountain with the same pack you are wearing there unboned with head and cape still attached and I never got to weigh that pack but I can tell you that my body was going to break before that pack did( I'm guessing 120-150 lbs most of my gear was back at camp). If you read my post on the other thread you know I wound up with the G-6000 purely by accident because Mystery Ranch sent me the wrong product by mistake and as soon as I strapped the thing on, I knew I had to keep it. But it begs the question, why not order a few of the packs you are interested in, put some clean weight in each one, then blaze up/down the stairs or whatever to get a feel for the comfort? Just keep the one you like best and ship the others back. Of course, you wont be able to get them out in the bush and dirty them up but it would give you a rare chance to try it before you buy it. It may not work with all of the manufactures but you might inquire with them up front and let them know what you're up to. Give them a bit of a challenge, so to speak. Update, was able to find a new, never used late 90's Terraplane on ebay and got it for $200 shipped. So we'll see how it fits the bill next year. Thanks for the advice guys. I am partial to the Danas because I have yet to see one that didn't do twice what was expected of it. I am also programmed to the use of this bags pockets from having had the Terraframe. Thought I would go this route before shelling out the 5 bills on the MR.